Article - Having the Builders in..
Having builders in ranks as one of the most stressful times of your life – almost half the population say it’s as stressful as arranging a wedding, buying a house or even having a baby – and, would you believe, worse than spending a week with the in-laws! Top on the irritation list are builders who don’t finish on time, ones who don't turn up when they say they will and those who run over budget. "It’s a massive invasion of your personal space. It means you have to adjust your private life to fit in with these strangers and this can put real strains on the family," says psychologist Donna Dawson. "The key is to keep cool, keep talking and keep it friendly." Some of us, though, have sorted out the stress - around 20% of us move out during building work, 16% go on holiday, 22% use a recommended builder and 11% use a written contract. Asked about other ways of finding solace from the stress, 40% said they would visit the gym or take up yoga, 14% said they would turn to alcohol and one in ten said they would get counselling. The majority - 75% - said they would employ an accredited builder, such as a member of Safe Local Trades, to keep stress levels down. 2. Provide a detailed specification and make sure the builders’ estimates cover everything. EAST ANGLIANS: East Anglians stood out nationally as the homeowners most likely to hit the bottle to escape the stress of having the builders in. 25% – as opposed to 14% nationally - would turn to alcohol as their solace. LONDONERS: Exercise is the Londoners’ escape from builders. Almost half Londoners (48%) – the highest number nationally – said they would escape from the stress of having the builders in by turning to the gym or doing yoga. SOUTH EAST: Exercise is the Southeners’ escape from builders. Almost half of South East homeowners (48%) – the highest number nationally – said they would escape from the stress of having the builders in by turning to the gym or doing yoga. MIDLAND: Midland homeowners vote with their feet when the builders move in. One in three (33%) – the highest figure nationally – move out to beat the stress of building work. SCOTLAND: Almost half of all Scottish homeowners (44%) would turn to exercise to escape the builders – either off to the gym or taking up yoga. Scottish homeowners were also by far the most likely nationally (84%) to get insurance or a warranty against something going wrong. 90% of Scottish homeowners – the highest nationally - said they would employ an accredited builder, such as an Safe Local Trades Member, to reduce stress. SOUTH WEST: South West homeowners say they’d vote with their feet when the builders move in. The majority (80%) – the highest figure nationally – said they’d like to move out to beat the stress of building work. 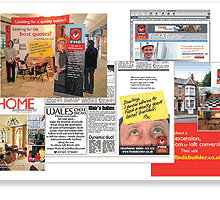 WALES: Welsh homeowners vote with their feet when the builders move in. Almost one in five (19%) move out to beat the stress of building work. NORTH EAST: North East homeowners are more chilled out than the rest of Britain about builders moving in. While almost 50% of Brits compare the stress caused by builders with buying a house or having a baby - and 55% find it worse than spending a week with the in-laws, only a third of North East homeowners are stressed out by the same experience. More than half of North East homeowners - 60% - said they’d go on holiday to reduce the stress, but the majority (86%) – one of the highest nationally - said they would employ an accredited builder, such as an Safe Local Trades Member.